What are ticket prices? The 2018 ticket prices ranged from $140 to $170 per ticket (prices subject to additional processing fee and handling charge). All guests can enjoy the cocktail party and a wonderful dinner before being escorted into the main auditorium for the program. What should I wear? Most men wear a suit and tie, and women wear evening attire (but not formal wear). Where do I park? NEW IN 2018: A pre-purchased parking permit is required for the on-site parking deck (Pre-Paid Parking Permit). Some patrons choose to find on-street parking or at area surface lots, but a pre-purchased parking permit is strongly encouraged. What time should I arrive? We encourage all guests to allow extra time for the parking and security screening process. In 2018, the parking deck opened at 3:30 p.m., the cocktail party began at 5:00 p.m.; doors to the dinner opened at 5:45 p.m., and dinner was served promptly at 6:00 p.m.
What special treats can I look forward to at this event? Next year, guests will offer a warm welcome to the 2019 Class of Enshrinees as they briefly tour each dining area, and again as they receive their gold jackets, one of the symbols of their induction into the Pro Football Hall of Fame. Attendees will greet their football heroes as a huge contingent of Gold Jackets will be in attendance. All of this will be captured and broadcast by the NFL Network! What time does the event conclude? In 2018, the event concluded around 9:30 p.m. QUESTIONS OR NEED FURTHER INFO -- Contact Event Manager Elissa Prazer at elissap@cantonchamber.org or 330.458.2052. Click here for TICKET INFORMATION or contact Ticket Manager Kim Miller at kimm@cantonchamber.org or 330.458.2048. 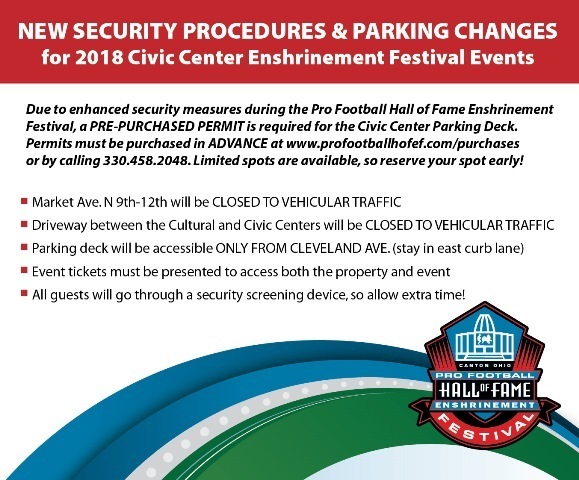 THE 2018SECURITY PROCEDURE & PARKING CHANGES WILL STAY THE SAME FOR THE 2019 EVENTS. PLEASE PLAN YOU TRIP ACCORDINGLY.